Senator Al Gore, a former theology student, chose Joe Lieberman as his running mate. Joseph Lieberman might have been the first Jew elected to such a high office had they won the narrow election. When Lieberman quoted a passage from the Old Testament, “Give thanks to God and declare His name.” He was surprised at the paradoxical and negative reaction. Liberals celebrated the fact that a non-Christian was on a national ticket, but disdained his references to his faith, his quotations of Scripture. They apparently wanted him to be Jewish, without being Jewish. 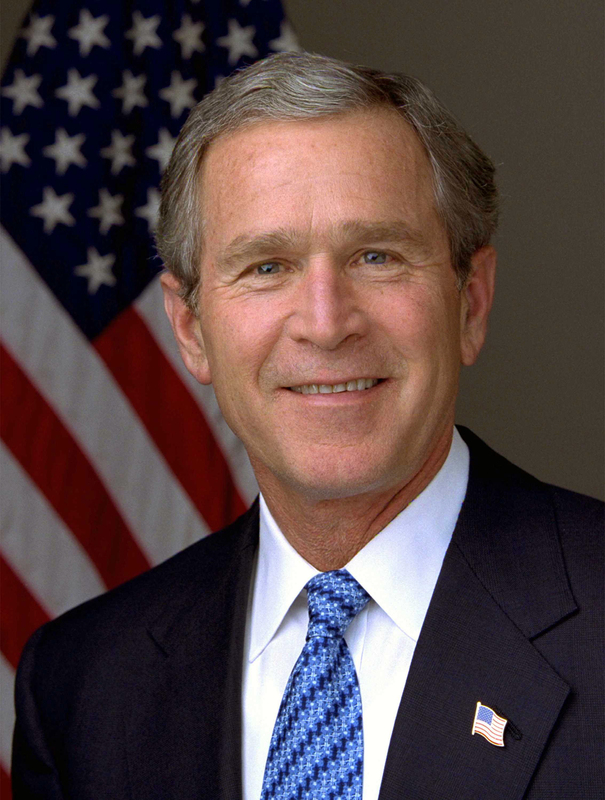 George W. Bush declared his intention that faith be a partner in his effort to serve the nation during his inaugural address, declaring that “some needs and hurts are so deep that they will respond only to a mentor’s touch or a pastor’s prayer.” He went on to stress that the faith community must be partners, given “an honored place in our national plans and our laws.” What made his remarks unique was that he defined the faith community as consisting of – churches, synagogues and mosques. The ‘inclusive’ remarks were not enough for the liberal anti-Christian media. They were outraged that both the Methodist pastor, Kirbyjon Caldwell and Franklin Graham cited ‘Jesus’ in their prayers. Bush was more open about his faith than Bill Clinton, or even his father, had been. And while Reagan had spoken openly and eloquently about faith, for George Bush it seemed much more personal. He spoke of his addiction battle and how faith had helped him overcome. He called ‘Jesus Christ’ the man he most admired. His autobiography bore the title, A Charge to Keep, taken from a Charles Wesley hymn. His life had changed during a weekend at his father’s home in Kennebunkport. Billy Graham had been a guest that weekend. From that time on, Bush took a different route with his life. When the Crown Prince Abdullah was in Crawford, Texas, he sat down to a noon meal. Bush bowed his head and reached for the hand of the Prince as he said grace. The Prince recoiled at first, then asked his aide, “What should I do?” Understanding the President’s intent, he too bowed his head. Bush not only blessed the food, but he prayed for God’s wisdom in the difficult talks that lay ahead. The Prince would remark later, that he found the faith of Bush among the things he most admired. It was Palm Sunday and Presidential duties dictated that Church attendance was out. Andy Card was Chief of Staff. He along with Karen Hughes, Communications Director; Condoleezza Rice, National Security Advisor, suggested that they take time for an informal prayer service aboard Air Force One. It was a first, someone has suggested, but it was evidently, not the last. We will never know what the Bush Presidency might have been without 9-11. The event cast a shadow over the tenure of George W. Bush. 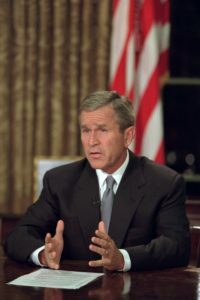 Immediately after the Islamic terrorism of September 11, President George W. Bush addressed the nation from the Oval Office saying, “Tonight I ask for your prayers for all those who grieve, for the children whose worlds have been shattered, for all those whose sense of safety and security has been threatened. And I pray that they will be comforted…” And then he quoted a portion of Psalm 23. As the Cabinet assembled, Don Rumsfeld offered prayer. The President, along with his staff stood before the nation for a moment of prayer. He also called for special Days of Prayer following the 9-11 attacks. After Hurricane Katrina almost destroyed New Orleans and ravaged the Gulf Coast, the President again called for prayer. Throughout our history, Americans of faith have always turned to prayer — for wisdom, prayer for resolve, prayers for compassion and strength, prayers for commitment to justice and for a spirit of forgiveness. Since America’s founding, prayer has reassured us that the hand of God is guiding the affairs of this nation. We have never asserted a special claim on His favor, yet we’ve always believed in God’s presence in our lives. This has always been true. But it has never been more true since September 11th. Prayer has comforted people in grief. Prayer has served as a unifying factor in our nation. Prayer gives us strength for the journey ahead. I work the rope lines a lot, and people say, ‘Mr. President, I pray for you and your family.’ I turn to them, I look them in the eye, and say, that’s the greatest gift you can give. That’s the greatest gift you can give. I mean it with all sincerity. And so I want to thank you for your prayers. I want to thank you for what you do for our nation. I want to thank you for your good works. I want to thank you for helping change America one heart, one soul, one conscience at a time. President Barack Obama has dutifully signed the National Day of Prayer Proclamation, as required by law, but he has refused participation in the event, and denied the White House of the ceremony that has taken place there for years. He has, however, quietly hosted a Ramadan gathering each year at the White House. On a working Sunday in the White House, President Bill Clinton also had a national speech in the making. During a break, the speech writer, who had been crafting the speech gave the President a moment to review it. It seemed fine, with the exception of one inconsequential line. “I assure you,” Clinton read the draft, “that no president makes decisions like this one without deep thought.” He paused over the line, and repeated it. Then, he penciled in two words, “…and prayer.” In the midst of the Cuban missile crisis, John Kennedy, a Roman Catholic, stopped by St. Matthew’s Cathedral, a few blocks from the White House, for prayer. Yes, the President’s pray. Thank God. And may the day never come that they do not pray – to the God of the Bible, ‘Our Father…” And may the war against public prayer in the nation soon come to an end. This teaching will be included in the upcoming The Praying Church Handbook – Volume IV – Intercessory Prayer and Mission. Purchase the Paperback book for $14.99 (retail value $19.99). Purchase 10 Paperback Books at a discounted cost of $9.99 each (retail value $19.99 each) and receive the Resource Kit for Free. Total purchase is $99.99 ($249.89). David Frum, The Right Man: The Surprise Presidency of George W. Bush (New York: Random House, 2003), 283. Elsa Walsh, “Profiles: The Prince,” New Yorker (March 24, 2003), 62-63. President George W. Bush. Excerpts from the President’s remarks at the National Hispanic Prayer Breakfast, May 16, 2002. Thank you Bro. Small for all that you are doing for the kingdom. Good reading here. Love & prayers to your family & Project Pray, give my love to Barbara.